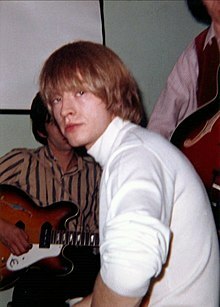 Lewis Brian Hopkin Jones (28 February 1942 – 3 July 1969) was an English musician, best known as the founder and the original leader of the Rolling Stones. Initially a slide guitarist, Jones would go on to play a wide variety of instruments on Rolling Stones recordings and in concerts, such as rhythm and lead guitar, sitar, dulcimer, various keyboard instruments such as piano and mellotron, marimba, wind instruments such as harmonica, recorder, saxophone, as well as drums and numerous others. Jones and fellow guitarist Keith Richards developed a unique style of guitar play that Richards refers to as the "ancient art of weaving" where both players would play rhythm and lead parts together; Richards would carry the style on with later Stones guitarists and the sound would become a Rolling Stones trademark.